On Saturday 15th August, neo-Nazis will attempt to march through Liverpool. The so-called “White Man March” – this time on its second outing – is organised primarily by members of neo-Nazi youth group National Action. It is supported by neo-Nazi groups from across Europe. In March this year, the first “White Man March” took place in Newcastle. Around 100 neo-Nazis marched through the city before burning gay, communist and Israeli flags, screaming “Hitler was right” and sieg-heiling at counter-protestors. Although small compared to other far right protests, this was the largest and most explicit neo-Nazi march to take place in the UK since the eighties. These events have been organised by people from an alliance of neo-Nazi groups. In Newcastle National Action were joined on the streets by the British Movement, Creativity Alliance, Misanthropic Division and National Rebirth of Poland. We expect the EDL splinter group North West Infidels to join this march. They have been responsible for attacks on picket lines, anti-fascists and Irish republican marches in Liverpool. National Action members openly praise Hitler, trade anti-Semitic conspiracy theories and talk about their genocidal fantasies. Liverpool resident and National Action member Garron Helm was jailed for sending anti-Semitic abuse to MP Luciana Berger. While some far-right groups have tried to moderate their public face, National Action revel in their blatant Nazism. These groups are growing as other parts of the far right collapse. Although they are nearly all tiny by themselves, the numbers they can bring out for the “White Man March” are worrying. Liverpool, as a city with a proud left-wing tradition, has been chosen to demonstrate the “strength” of the neo-Nazi movement. We expect to see more than the 100 they brought to Newcastle and if we want to stop their growth they must be opposed. In 2013 we saw 5000 people march against fascist Nick Griffin and we need to draw on the city’s anti-fascist roots when the “White Man March” comes to town. History has shown that Nazis need to be confronted head on, so they don’t have the space to spread their racist bile and grow in size and confidence. Given the chance, they will attack workers’ organisations, ethnic minorities, LGBT people and anyone else they perceive as their enemy. 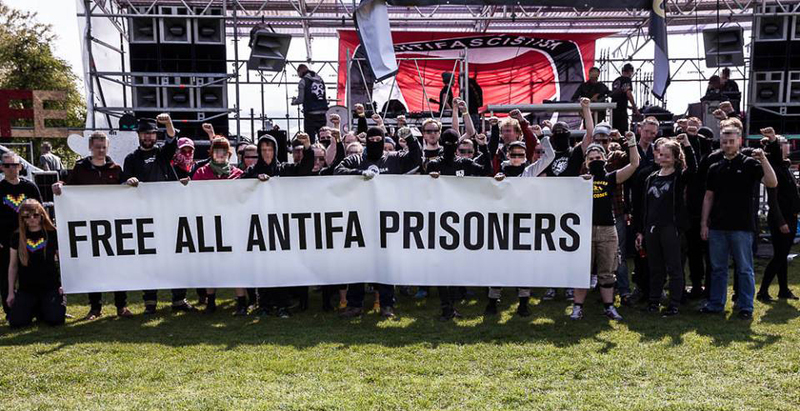 We are calling on anti-fascists across the North West to stand with the people of Liverpool in opposing these Nazi thugs. SOLIDARITY CALLOUT: MR. BIELA, START THE REPAIRS! Join Bristol Solidarity Network’s fight against a slum landlord and for decent housing. Mr Ernie Biela, of 58 ETHELBERT ROAD, MARGATE, KENT, CT9 1SB is a slum landlord intent on maximum profit and minimum responsibility. A family living in one of his properties in Easton, Bristol have repeatedly asked him for much needed repairs to their home. After 8 years of ignoring his tenant’s requests for a livable home, Mr. Biela recently tried to evict them rather than do the right thing and do the repairs. He has arrogantly flouted the law and disregarded council improvement notices served on him. In phone calls to the tenants he claims to understand what life is like for immigrants and low income families. He is very quick to chase rent, claiming he will use it for repairs, but not as good at fixing the house. He agrees to send builders round to carry out work but instead sends an eviction notice which we found to be invalid. The family has suffered a great deal of stress and anxiety facing the threat of being made homeless. The house is in an appalling state of disrepair, with a seriously leaky roof, huge cracks in walls and ceilings, broken doors, rotting window frames and intolerable mould, cold and damp. According to the council there is a class 1 hazard of mould. Four family members, including three children, have developed asthma as a result of these conditions they have been forced to live in by the landlord’s neglect. We will not allow this absentee landlord to bully and threaten this family into keeping quiet about the state of their home. Neither will we let Mr Biela ignore his responsibility to provide a decent home and safe environment for this family. It’s time to put the pressure on. Please take some time to support this family and make a stand against this bad landlord. From Tuesday 21st July we are calling for an ongoing communications blockade and constant phone and email reminders for Mr. Biela. This briefing has four aims: firstly to provide an update on the state of the war against Islamic State; secondly to assess the reasons for Islamic State’s resilience; thirdly to question whether an extension of the UK involvement in the war is wise; and finally to examine alternative courses of action for the UK. A three-part series of ORG briefings on Islamic State, in February, April and May, analysed the status of the movement, looking initially at indications early in the year that it might be in retreat after its series of unexpected gains in 2014. The conclusion was cautious as to the actual degree of retreat, and the April and May briefings then examined its resilience and the possibility of its spread to other states. Two months later, and bearing in mind two anniversaries in early July – the establishment of the Islamic State proto-caliphate in a proclamation in Mosul a year ago, and the tenth anniversary of the 7/7 London bombings – it is appropriate to return to an analysis of the status of the movement. This is especially pertinent in relation to the 26 June attack on the tourists at a beach resort just north of Sousse in Tunisia which killed 38 people, 30 of them from Britain. Following the attack, the UK Prime Minister, David Cameron, announced that Britain would embark on a “full spectrum response”. Defence Secretary Michael Fallon made it clear that extending Britain’s role in the coalition air war against Islamic State to Syria was being actively considered, but it was accepted that parliamentary approval would be required and might be sought before the end of the current session on 21 July. A further element in the post-Sousse attack was the decision of the Foreign and Commonwealth Office two weeks later to advise British nationals to leave Tunisia because of a possible further attack. This confirmed the view of some analysts that Islamic State was specifically targeting the UK, a factor that appears to underpin the intention of the government that UK involvement in the coalition air war must extend to Syria. Abu Bakr al-Baghdadi declared the new Caliphate, Islamic State, in Mosul on 4 July last year, following the rapid takeover of much of north-west Iraq by the new movement, culminating in the collapse of Iraqi Army units and the taking of Iraq’s second city of Mosul. Two months later the United States started air strikes against Islamic State forces in Iraq, later being joined by many other states, including the UK. The US then extended its bombing to Syria with some of the coalition partners joining in, although the overwhelming majority of air strikes there are conducted by US forces. Britain is not currently involved in Syrian airstrikes but in the overall war it is second only to the US in the extent of its involvement. Its main contribution is Tornado strike aircraft operating out of RAF Akrotiri on Cyprus and Reaper armed drones deployed from Kuwait but operated from RAF Waddington in Lincolnshire. In nearly a year of the air war the US claims that the coalition has undertaken around 15,600 air sorties, has hit over 7,000 targets and is killing a thousand Islamic State fighters every month, about 10,000 since the air war started, although there is no independent verification and no way of knowing how many of them were actually civilians. Over the past nine months UK forces are reported to have killed 240 Islamic State supporters through air operations by strike aircraft and armed drones. Islamic State has not only survived all the attacks but in many places is thriving, attracting up to a thousand new recruits each month from across the region and beyond, including more than a thousand from Russia. It has consolidated its organisational hold on towns and cities across the substantial territory it has overrun, demonstrating a brutal ability to control and manage them. Trying to explain such tough competence and organisation and why Islamic State looks increasingly to be a robust entity is crucial if we are to understand its prospects, and this is best understood by recognising that the movement is an integrated coalition of elements. At its core is an extreme religious outlook rooted in a perverted interpretation of Islam that looks to create a “pure” caliphate. This has a strong eschatological element that looks beyond this earthly life, an aspect that has two particular effects. One is that it is working to a long time scale, far longer than most revolutionary movements, and the other is that it attracts people readily wanting to give their lives to the cause. A second element is that Islamic State has a core of highly experienced paramilitary fighters and leaders, most likely numbered in the thousands. They draw on many nationalities and include people with extensive experience of fighting in Chechnya, Libya, Bosnia, Afghanistan, Kashmir and many other recent zones of conflict. The main element, though, stems from Iraqis who fought western forces in Iraq from 2003. At the centre of this are highly experienced, resentful, angry and determined Iraqis who survived the extensive but largely unreported “dirty war” fought by US and UK Special Forces in central and western Iraq between 2004 and 2008, run by US Joint Special Operations Command (JSOC). Finally there is a technocratic element that may or may not have extreme religious outlooks but has a range of competencies in many fields of urban and rural management and organisation. Most of these are drawn from the ranks of former Iraqi Baath Party members with huge experience of the rigid technocratic system of the Saddam Hussein era. This last element is far more important than is currently recognised and is reflected in the ability of Islamic State to run towns and cities, organising public services including transport, food distribution, sanitation, health and educational services. The provision may be backed up by brutal force and violent suppression of any opposition but is, at least for now, providing stability and even a degree of support. One of the most indicative demonstrations of competence comes from frequent reports that IS-controlled territory sees a great reduction of bribery and corruption, in marked contrast to preceding experience. At present IS seeks to consolidate and expand its control of territory while extending its influence to other states, the main ones being Libya and Afghanistan, though the singularly tough anti-Islamist policies of the al-Sisi government in Egypt make that a strong candidate for additional support to opposition elements, not least in Sinai. In addition, Islamic State needs a steady flow of recruits from across the region and beyond and is especially interested in recruits from western states with significant Muslim diasporas among their populations. By far the most difficult challenge for a UK government is recognising that it has little capacity to influence events in the region, partly because of its past policies, especially its contribution to deeply unpopular wars that have helped create Islamic State. It is natural enough that the demand that “something must be done” is met in some way, and that with Britain being a significant military power that has used its forces on so many occasions in the past century, not least in Iraq and the Middle East, it should believe that this is once again the answer. The problem is that this is precisely what Islamic State wants. Its strongest recruiting tactic is to present itself as the one true guardian of Islam under attack from “crusader” forces. In doing so it points to the recent western intervention and occupation of Iraq and Afghanistan and the use of force in Libya, Somalia, Yemen, Pakistan and Mali as well as the support for repressive regimes in Saudi Arabia, Egypt and elsewhere, not forgetting sustained western support for Israel. This, in turn, is rooted in a much more general representation of Islam under essential need of renewal back to the “true faith” espoused by Islamic State, following a retreat stretching back centuries and even to the high point of the Abbasid caliphate a millennium ago. In the case of the UK it can point to its specific involvement in the Middle East back to the 1916 Sykes-Picot Agreement and the Palestine Mandate, and it sees marginalised young Muslims in the UK as fertile ground for current recruitment. This, in its view, will be aided by greater British involvement in the air war – further proof that the UK is part of the crusader assault on Islam. The Sousse attack should be seen as a direct provocation, an incitement to the UK government to bomb Syria, and there may well be further attacks. 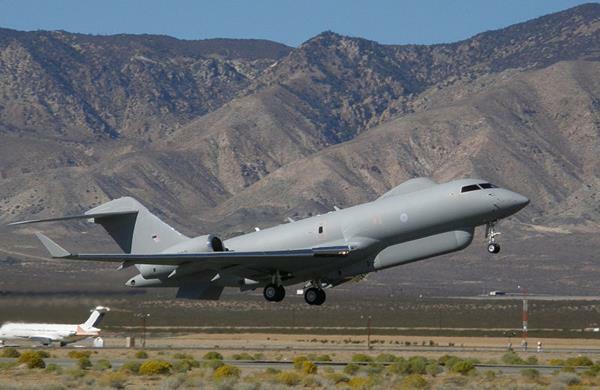 If the UK government decides not to extend its participation in the air war to Syria, perhaps through failing to get parliamentary approval, then there are actions which can be taken. A humanitarian disaster is unfolding across the Middle East, with huge pressures in particular on Lebanon and Jordan. Resources to aid mass refugee flows are sparse and the UN is under considerable pressure to respond. Quite apart from the humanitarian imperative, there is the risk of greatly increased bitterness on the part of hundreds of thousands if not millions of people displaced from their homes and even their countries. Britain has been prominent in underwriting UN programmes of aid and helping in other ways, but there is scope hugely to increase its support. This should be a priority. • Priority should be given to encouraging much stronger dialogue between Iran and Saudi Arabia, the two most important players in what is in many ways a proxy war in Syria. • This should extend to improving dialogue with Russia, bearing in mind that Russia itself has a growing internal problem of Islamist extremism and has an interest in limiting the further growth and influence of Islamic State in the Caucasus. • There should be specific efforts to aid and support UN and other initiatives in seeking to resolve the bitter conflicts in Libya which will otherwise provide fertile ground for the growth of Islamic State influence. • The UK should use its best endeavours to encourage the al-Sisi government in Egypt to rethink its suppression of the Muslim Brotherhood, since there is potential here for IS influence to grow rapidly. Britain should seek to influence the Abadi government in Baghdad and the Rouhani government in Tehran to ensure a greater reaching out to the Sunni minority in Iraq, the continuing marginalisation of this community being one reason for its support for Islamic State. An eventual political settlement in Syria that is inclusive enough to share power between Sunnis, Alawites, Christians, Druze, Kurds and others is also imperative to peace there. These responses may not specifically limit Islamic State in the short term, but could help to contain its further advance, which should be a policy priority. Responding to the current predicament by bombing Syria will not do this. There are no easy answers to the serious problem posed by Islamic State but the evidence of western military action in the Middle East, North Africa and South Asia over the past fourteen years is that it is persistently counter-productive. Since in the case of Syria, Islamic State appears specifically hoping to provoke the UK to greater military involvement this should be avoided. Islamic State cannot be defeated by an air war, and there is no western appetite for a full-scale ground war. Even if there were, Islamic State would welcome it, anticipating a further surge in support for its cause. The fundamental issue is that Islamic State wants war and to extend its power to other regions. Working to prevent that spread and to respond to the huge humanitarian catastrophe should be a priority and Britain is singularly well-placed to contribute. In the longer term, the experience of recent years once again reinforces the need for genuine multilateralism through the UN and regional organisations as a means to channel and resolve geopolitical rivalries. An effective UN standing force such as the proposed UN Emergency Peace Service might also go some way to rectifying the huge distrust that much of the world has for US, UK or NATO-led ‘peacekeeping’ operations. There remains little or no appetite for this among UN member states in spite of the evident need, yet Britain could play a major role in encouraging the development of such a force. Much else is up to the states of the region to resolve within and among themselves. Paul Rogers is Global Security Consultant to Oxford Research Group (ORG) and Professor of Peace Studies at the University of Bradford. His Monthly Briefings are available from their website, where visitors can sign up to receive them via their newsletter each month. These briefings are circulated free of charge for non-profit use, but please consider making a donation to ORG, if you are able to do so. 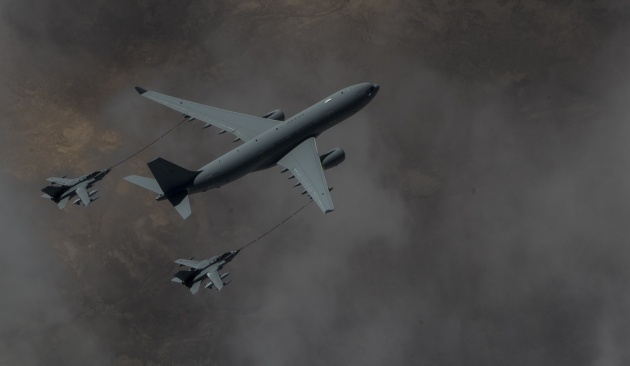 Image: An RAF Voyager KC2 refuels two RAF Tornado GR4 in March 2015 over Iraq. Image courtesy of Wikimedia. This is where reports of the July ride of Critical Mass London will be posted. If you were there, please write a short – or long! – report of where you rode, what you saw and post it as a comment here. Better still, you can ask for a user name for this blog and post on the body of this post to substitute this rant instead. That will make the work of checking closed facebook for reports finally obsolete. Thanks for riding and reporting in the open web!